If you’re anything like me, you probably don’t like to think about death – yours or anyone else’s. But, unfortunately it’s one of those things in life that will happen for sure; no ifs and buts about it. I don’t want to come across as morbid today, but I think death is a subject worth writing about, especially because in the event of your own death, it can impact your loved ones in more ways than one. Yes, I’m referring to the financial impact of dying. The matter of money doesn’t end in the event of your death. 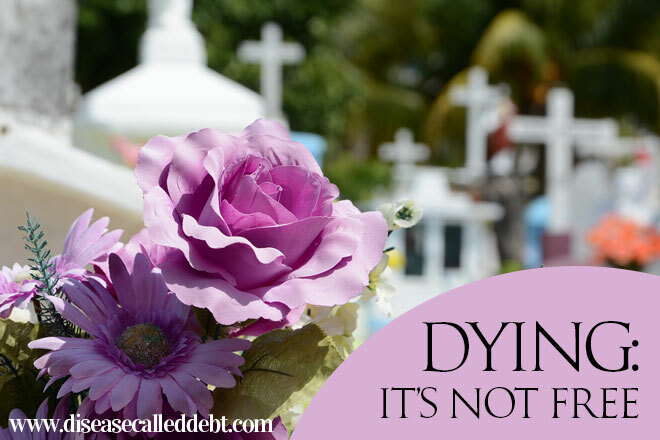 If you have debts, when you die, they won’t just die with you. It’ll be up to your next of kin to settle your debts from your estate. Even if you don’t have debts, there’s still another sticky monetary subject to consider. That’s the cost of laying your body to rest – that’s if you don’t fancy donating it to science – which actually involves very little cost. Most people however, prefer to have a funeral service, consisting of a burial or cremation. Both of these options usually involve appointing a funeral director, embalming the body (a thought I don’t want to dwell on too much), choosing a coffin and then arranging the cars and the wake. All of these arrangements can add up to between £2000 and £3000. There are additional costs to consider too such as flowers, a headstone or some other kind of memorial feature. This infographic created by the over 50’s life insurance provider British Seniors outlines the associated costs of death and the arrangements involved. 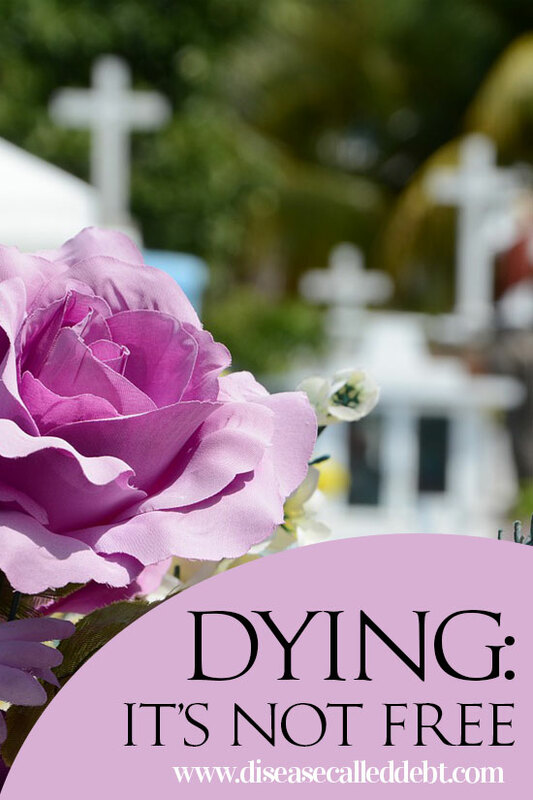 Death is hard enough for family and friends left behind, without them having to worry about how they are going to afford to give you a good send off. My husband and I both have life insurance policies that pay out in the event of our deaths. We’ve had them for a long time; they were originally designed to cover our mortgage payments should the worst happen to one of us. If the worst should happen now, the life insurance policies we have would cover the cost of a funeral too. If you don’t have life insurance already and you’re over 50, it can be tricky to get a policy that will pay out on the event of your death. British Seniors do offer over 50’s life insurance – a lifetime payback guarantee policy that will pay out a lump sum to your family (or whoever you put down to receive the benefit) that’s no less than the amount of premiums paid in. This is worth considering if you’re at the age where other insurers are likely to reject you for a policy. An alternative way to fund the cost of a funeral is simply by making sure you have enough money in savings to cover the cost. You’d need to make sure you choose someone to handle your financial affairs when the time comes and that they know about your will and your estate. As the saying goes, there’s nothing more certain in life than death and taxes. Whilst the thought of planning for the cost of a funeral seems bleak and depressing, it is an important consideration – especially if you don’t want to leave your loved ones with even more to deal with than their loss. Do you have some kind of financial plan in place for the inevitable? This is a collaborative post with British Seniors Insurance Agency who specialise in over 50’s life insurance. All opinions are my own. Find out more about their over 50’s life insurance products here. Think it s important to think about this and act up on it. Hi Anna-Karin, thanks for commenting. It’s not something that most people will want to think about is it, but an important financial consideration all the same. I guess it depends on your religious beliefs whether you want a church funeral or not. It’s good that you know what you want – I’m still not sure! I m sure you ll figure out how you want to do it! There is no right or wrong way, but it s important to think abouot it and then decide how to do it. Good luck! It is an absolutely essential topic to think about! I don’t think it’s morbid at all, just practical and sensible – it’s only a modern-day taboo that has only become taboo in the past 50 years or so. It is also essential to make a will; even if someone has debts, they may also have equity in a house and/or a pension pot. A friend’s widowed mum remarried a few years ago and sadly died suddenly a couple of years later. She didn’t realise that her remarriage made her will null and void; by law everything went to her new spouse and her daughter got nothing. If you don’t know probate law, you don’t know who will end up with your money. A very important topic. I have life insurance, although as a senior, it’s becoming less and less affordable. It’s also a good idea to have your final wishes in writing so that your surviving family knows how you would like to be laid to rest (cremation versus burial, what type of service, etc.). Gary @ Super Saving Tips recently posted…The Stock Market: Should You Invest in It? Though I don’t have one yet, I think this is really an important financial security for everyone of us. We should be prepared for anything. A preacher we knew once said “we are born to die.” I hated that saying but it’s so true. We have life insurance that will cover our funeral expenses when we die and a will. Something I would like to do one day is go and plan my funeral. I think it would be so nice to have the worries over with for my oldest daughter who is in charge. She will remember good things then. Great post and one that needs to be talked about. As someone who has recently buried her parents I can agree that death is expensive. I’d say the thing to do is take a look at your assets and consider “what if” you ended up in a nursing home. How long would the money last? If the money would likely outlive you, then a senior citizen carrying life insurance is an unneeded expense. If you are likely to die broke, a pre-paid funeral plan is an asset that Medicaid (pays nursing home bills for poor people in the US, but requires that you have very few assets to use it) lets you keep. We have term policies on both of us, even though I’m a stay at home mom. He’d have to find babysitting if I weren’t around, and that isn’t cheap. When I had to take care of this for my mom, I was really glad she had both accumulated the money and left instructions. Fortunately, things were very simple: She wanted to be cremated, so we had just the least expensive casket and a nice simple urn for the ashes. Her church did not charge for a service for it’s members, though we did have to cover a small fee for the organist. It really is such an important topic to discuss. Avoid it and not doing anything only harms your loved ones down the line. My father passed away just a few short years ago so I saw first hand what the financial aftermath is like. My sister and I both are talking often about what might happen when our mother passes, especially if she doesn’t handle her money well in her later years. This is really an important topic and investment that we should take into consideration, but mostly of us rarely talk or consider this option as part of investment.